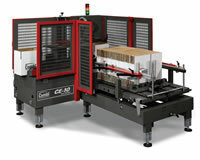 The new Combi CE-10 is an automatic system that erects and bottom seals corrugated cases at speeds from 500 to 700 cases per hour. This versatile system can create instant labor savings and increase production for a wide range of medium-speed applications. With industry-leading standard features like low-case/low- tape alarms and fast no-tool changeovers, the CE-10 is a simple, operator-friendly solution for your packaging line.